Philadelphia students, teachers and allies—including a majority of City Council members—are pushing back against the district's proposed closing of thirty-seven schools. During one of many anti-austerity protests last summer, more than 1,000 people rallied to oppose the Philadelphia District’s plans to “transform schools,” a pleasant euphemism generally meaning school closures and mass layoffs. The Philly district planned to lay off 2,700 blue-collar workers, including every member of the SEIU 32BJ Local 1201, the city school union representing bus assistants, cleaners, mechanics, and other workers. In late July, the School Reform Commission scrapped those plans and approved a contract that avoided layoffs, but led to worker salary reductions (employees had between $5 and $45 deducted each week from their pay). Additionally, the union nixed two planned wage increases—a 3 percent jump set for earlier in the year and another raise that would have kicked in the first of this year. Despite the union’s concession, the district still has a $282 million deficit, and the Philadelphia School District’s plan to save money is closing one in six public schools in the area, a move that activists, clergy and some officials say will disproportionately affect students of colors, as well as poor and disabled students. 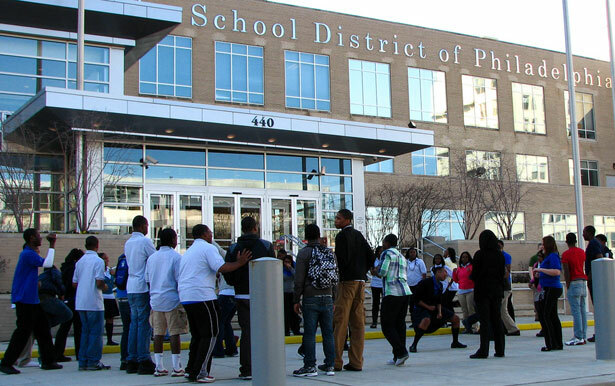 According to an analysis completed by the Philadelphia Coalition Advocating for Public Schools (PCAPS)—an umbrella group made up of the district teachers’ union, Action United, and several other community organizations—81 percent of the roughly 15,000 students who would be affected by this year’s planned closings and mergers are African American. District-wide, 56 percent of students are African American. Most of the schools that would close—24—have populations that are more than 90 percent African American. Just three of the schools have white populations higher than the district average. The group also found that most of the schools targeted also have district higher-than-average populations of poor and disabled students. It’s worth remembering that in the spring, the School Reform Commission authorized an unprecedented expansion of more than 5,000 charter seats at a projected cost of $139 million over five years—at a time when Chief Recovery Officer Tom Knudsen threatened that schools may not even open in September. Among the expansions were a 1,400-student high school for Performing Arts Charter, even though the District already has four performing arts high schools drawing from a citywide population. Charters with school performance index figures that ranked them among the worst in the District received five-year renewals and expansions. In fact, of the 26 charters up for renewal last spring, the SRC voted to close just three, and two are appealing. Whatever your opinion may be of charters, there’s no question that the District has failed to explain its inconsistent approach of allowing charter expansion without regard to expense or academic quality while insisting on draconian and widespread sacrifice among District schools. This despite the fact that many of the District schools targeted for closure outperform some of the charters that the SRC renewed and expanded last spring. The numbers don’t add up on the alleged $28 million in savings the District says it will garner. District officials have not disclosed a full accounting of the transition costs and other expenses associated with closing schools—something that should be of grave concern given what we know about school-closing expenses. The district has always claimed that students will be relocated to schools on par or better than the ones they currently attend, but PCAPS claims that after closings, strong schools that remain open rarely have room for more students, leaving limited opportunity for children to move into better situations and making educational refugees out of former students. Last week, the Philadelphia City Council passed a non-binding resolution calling for a one-year moratorium on public school closings in the city, a move Philly.com calls “largely ceremonial” because the council cannot block any moves the School Reform Commission makes. Anne Gemmell, political director of umbrella advocacy group “Fight for Philly,” says the closings are unacceptable. Activists from Philadelphia are part of a national movement pushing back against school closings and turnarounds on civil rights grounds. Read more at TheNation.com’s Extra Credit blog.